The Muck Boot Company has launched its product line in Australia, saying the work boots are designed to cater for every type of person, and being 100 per cent waterproof, are ideal for this winter. Muck also reckons their range of work boots perfectly cater to the demanding nature of working in the great outdoors whether on the farm or on site. "No matter the purpose all Muck footwear is designed to tackle tough conditions in work, agriculture, lawn and garden, building and construction and all trade professions without neglecting style and comfort," the company says. Chore Series: A 5mm Neoprene bootie with a four-way stretch nylon that is 100 per cent waterproof, lightweight and flexible, and a durable and lightweight rubber outsole. This boot has a triple reinforced upper toe area and quadruple reinforced area on the heel, a steel shank for additional support and a quick-clean rubber overlay with a neoprene top for easy roll down. It’s available in high boot or mid-height for $134.95 and $129.95 respectively. 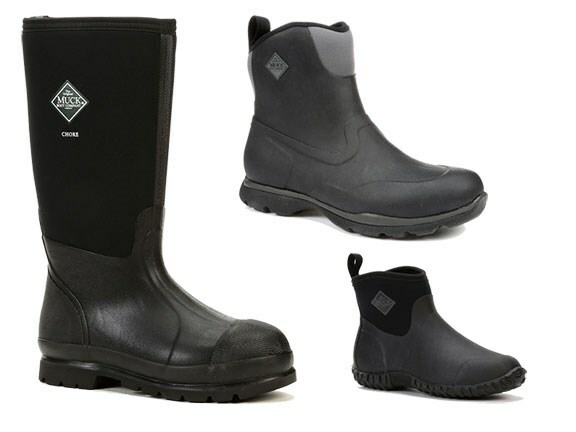 MuckMaster: Like the Chore Series, this is a 5mm Neoprene bootie with four-way stretch nylon. This commercial-grade boot has a stretch-fit top line binding which snugs the calf to keep warmth in and cold out. It has an extended rubber overlay for added protection and a 2mm thermal foam underlay added to the instep area for additional warmth. There’s also an EVA moulded midsole with contoured foot bed (internal) and a rugged and durable MS-1 moulded outsole is for improved protection and stability. These boots are available in tall ($149.95) and mid ($139.95) styles. Muckster II: Muck says these boots are ideal for any chore or task where there is mud, slush or rain. "Easy to slip-on and quick to kick-off, makes it a great ‘leave by the back door’ boot," the company says. "Slip them on and you will always feel dry and comfortable." Features of these boots are: Breathable air mesh lining; 4mm CR Flex-Foam; high-traction rubber outsole; and a comfort topline. The recommended retail price is $109.95. Excursion Pro: These $129.95 outdoor boots are designed to be versatile and feature generous rubber protection around the foot and a lightweight EVA outsole with rubber pods for better traction and support. They have XpressCool lining material designed to keep your feet cool and germ-free in warm weather and an etc sockliner to reduce friction and heat build-up.